If you've ever fancied pretending to be a character in Metal Gear Solid, then a new computing peripheral looks like it was designed expressly for you. 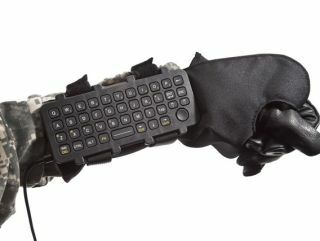 iKey Industrial Peripherals, formerly Texas Industrial Peripherals, has launched a wrist-mounted keyboard that allows its wearer to input data on the go. In keeping with its intended market, the military-grade AK-39 features electro-magnetic shielding to protect it from harsh environments, alongside adjustable and night-vision compatible green LED backlighting, and a snap-on protective faceplate to eliminate accidental keystrokes. Designed for use by military and emergency personnel, the AK-39 also incorporates a D-pad mouse and an integrated Force Sensing Resistor pointing device with left- and right-click functionality. Want one? Check out iKey's site right now.